When I got home in the evening of November 3, 2016 I found a parcel from a company in Germany. At first, I thought I had forgotten about an order, especially since the company name sounded familiar. I opened the parcel only to find a copy of a German photography magazine, together with a book containing nice black and white pictures. Eventually I also found a letter informing me that my picture ‘Taking Shelter’ was selected for the reader’s gallery, and the book was the reward. Wow! I had totally forgotten that back in August, I did submit one of my favorite black and white pictures. I found it in issue 114 of the German photography magazine SCHWARZWEISS, on page 75. The picture was published in the reader’s gallery, the topic was “Animal Portraits” (Tierporträts). The picture was taken in January 2012, as part of a ‘Winter’ workshop in the Nationalpark Gesäuse. It was already late in the afternoon, and visiting the huskies was the final location of the day. The weather was really bad, it was snowing heavily and the wind was strong. Finally, we found a group of huskies waiting for the next sled race. 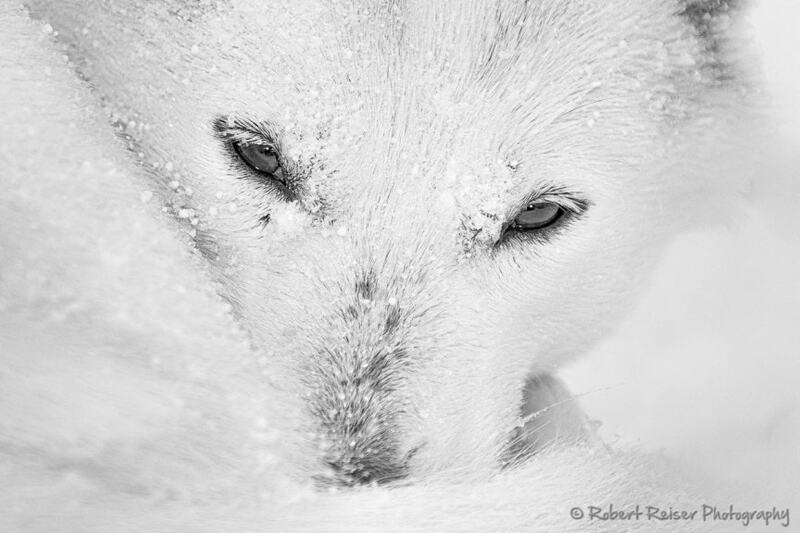 To protect themselves from the storm, huskies curl up and cover their noses with their tails. I was lying flat on the ground, to take the picture at eye level of the husky. Eventually, the husky looked at me and I had the eye contact I was waiting for. The on-camera flash was used to create the tiny sparks in the eyes. The color version of the picture is virtually indistinguishable from the black and white version. So, a simple desaturation in Lightroom did the trick. Some contrast adjustments and selective sharpening of the eyes did result in the image you can see above.